This section will cover how to configure the Internationalization package, and what areas of Salsa can be used with internationalization. The Internationalization package is not installed in Salsa by default. If you don't currently have it, please contact your Account Manager, who can help set up your organization with this package. 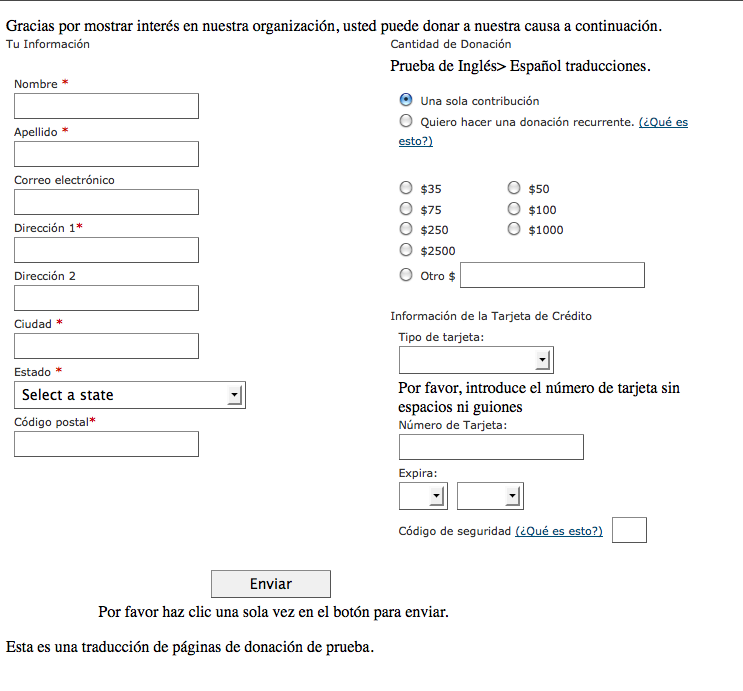 Below is an outline of the process for setting up translations for Salsa pages. You will translate the text and then copy and paste it back into the proper language section. 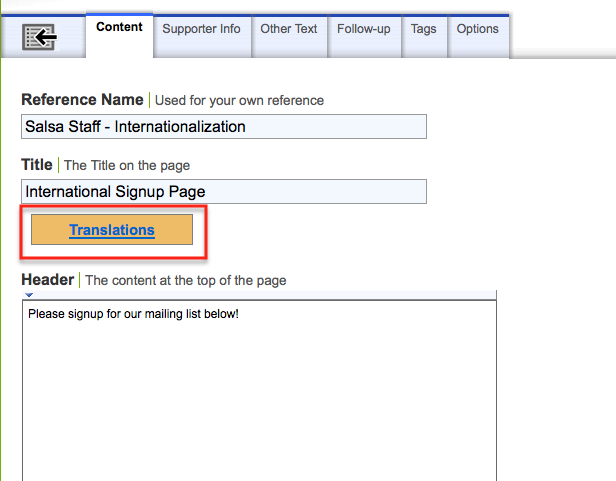 You can also simply enter your translated content in the target language manually. 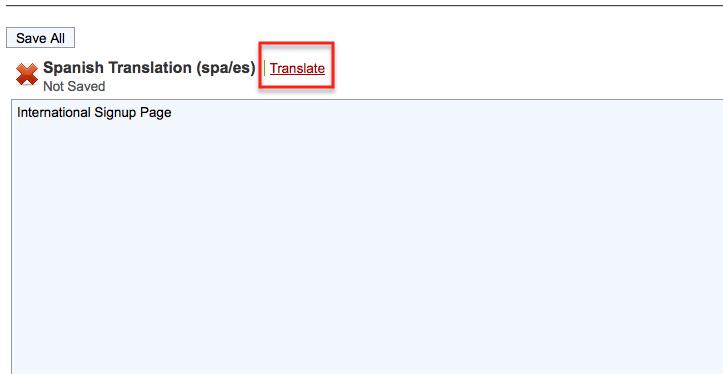 If you only need to translate into one language you can fill in that box and save the changes. For instance, If only Spanish-speaking supporters will be accessing the page, you don't need to worry about filling in the other language types. However, you also have the option of locking pages down to a particular language translation, simply by adding a small snippet of code to the page URL. You can find those instructions on the FAQ as well. 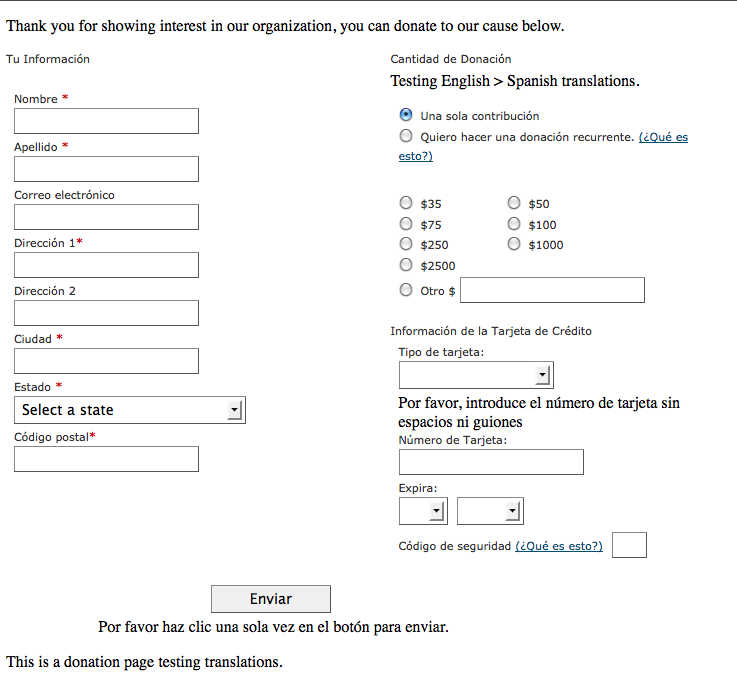 Using this method, you can also translate pages that don't have built-in translation options, such as Donation pages. In those cases, you will place your translated text into the Content section of your page setup, then add the language code to the URL. This will make sure both standard, Salsa-supplied fields (like First Name) and the page content are set to the proper language. What languages do you support? How do you know what language to display to a user? Some of the text on my page isn't translated. What's up? The text is aligning to the left on Arabic (etc) pages. How can I fix this? Your translations are wrong/silly/just generally awkward. Can you fix them? The State field in a public form is in English, and only shows US states. What's up? How do I change other content in a page that isn't translated, such as custom fields, etc? How do I enable language support on my page? I have the international package, how do I collect international donations? Salsa will first check to see if the URL has a language code listed, such as "l/ara/". If so, then content saved in that language will be displayed. 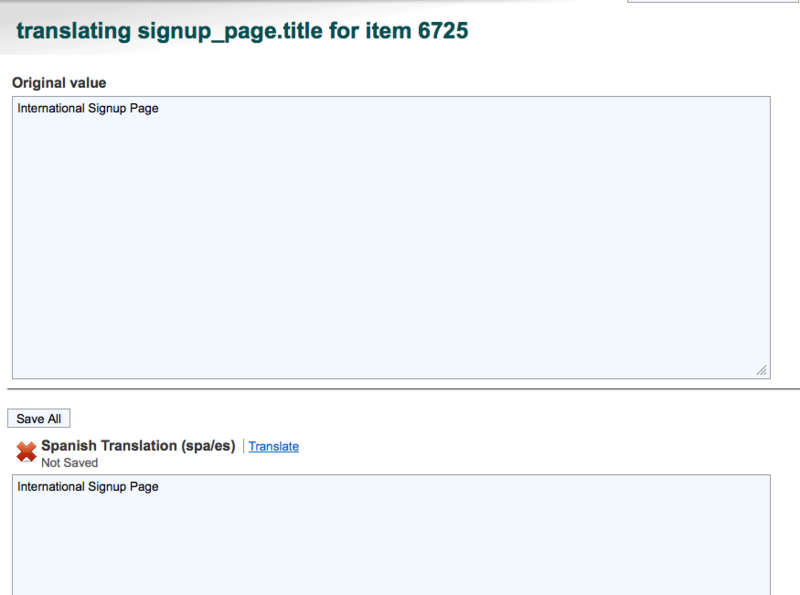 Next, Salsa will look to see if the user submits a cookie (lang=ara, etc), and use that cookie for the translations. Next, if the user has logged in, or we know who they are because of a past action or email click, Salsa will check the supporter field "Language_Code" to determine what language to deliver. Finally, if no language information can be determined, English will be displayed. For Portuguese use " /l/por/p / dia/action...."
Content Translations: For pages that support translations, the Headquarters will present a Translations link for each item of content, such as the Title or Description of a page. You should enter translations for each language you intend to support. If Translations are not available for a specific item of content, please submit a request to us to put it into our translation development list. Salsa Standard fields: Some translations, such as Submit buttons, First Name, Last Name, etc. are standard across all of Salsa. If there are a couple of words not translated, but the rest of the page is translated, it's likely our translators haven't reached it yet. Let us know, and we can see about getting it translated. into the html or tags. You can find more information on doing this here, or by Googling "html dir rtl"
We do the best we can to provide the most general translations to our common features. Sometimes, though, the translation doesn't fit your needs. If it's just plain wrong, let us know, and we'll get it fixed. But if it's a phrase that you don't want to use, you'll have to resort a custom field on the page. If that doesn't work, you can use our API with your existing content management system, or you can build a page from scratch with SalsaScript. See the Developers section for more details. Have the Salsa International package installed. 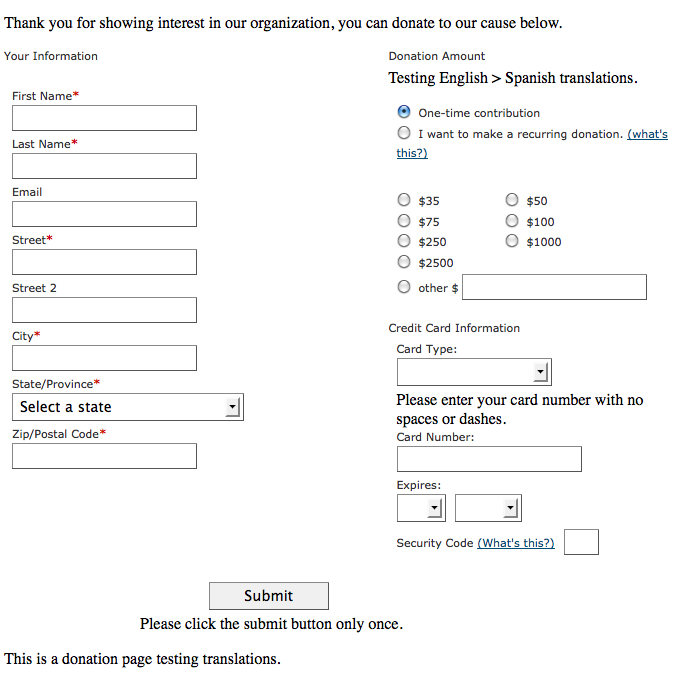 The international package allows you to change the languages of your public facing pages, however it does not change the way you accept donations. In order to allow international donations you need to choose a gateway that allows these type of transactions. It seems that a related page has been moved - the FAQ mentioned above (https://help.salsalabs.com/learn/packages/website-management/international-faq#h). Hi there. I need to translate a targeted action and a page into Spanish but when I go to the tab shown in the screenshot above, there is no translate button there and I can't find any links/button that would do that. Can you help me out? The Internationalization package is not installed in Salsa by default. If you don't currently have it, please contact your Account Manager, who can help set up your organization with this package. It should be an easy process for you.